Is there NOP hope for Parkinson’s? Please do not misread the title of this post! Compounds targeting the Nociceptin receptor (or NOP) could provide the Parkinson’s community with novel treatment options in the not-too-distant future. In pre-clinical models of Parkinson’s, compounds designed to block NOP have demonstrated neuroprotective properties, while drugs that stimulate NOP appear to be beneficial in reducing L-dopa induced dyskinesias. In today’s post we look at exactly what NOP is and what it does, we will review some of the Parkinson’s-based research that have been conducted so far, and we will look at what is happening in the clinic with regards to NOP-based treatments. On the surface of every cell in your body, there are lots of small proteins that are called receptors. They are numerous and ubiquitous. And they function act like a ‘light switch’ – allowing for certain biological processes to be initiated or inhibited. 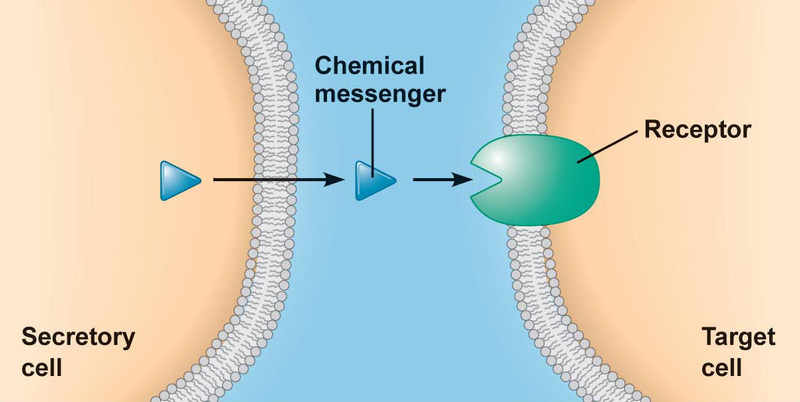 All a receptor requires to be activated (or blocked) is a chemical messenger – called a ligand – to come along and bind to it. Each type of receptor has a particular structure, which is specific to certain shaped ligands (the chemical messenger I mentioned above). These ligands are floating around in the extracellular space (the world outside of the cell), having been released (or secreted) by other cells. And this process represents one of the main methods by which cells communicate with each other. By binding to a receptor, the ligand can either activate the receptor or alternatively block it. The activator ligands are called agonists, while the blockers are antagonists. Many of the drugs we currently have available in the clinic function in this manner. For example, with Parkinson’s medications, some people will be taking Pramipexole (‘Mirapex’ and ‘Sifrol’) or Apomorphine (‘Apokyn’) to treat their symptoms. These drugs are Dopamine agonists because they bind to the dopamine receptors, and help with dopamine-mediated functions (dopamine being one of the chemicals that is severely in the Parkinsonian brain). 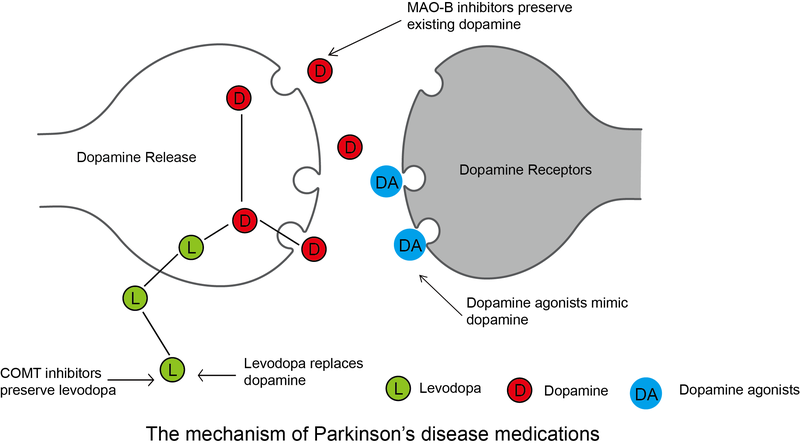 As you can see in the image below the blue dopamine agonists can bypass the dopamine production process (which is reduced in Parkinson’s) and bind directly to the dopamine receptors on the cells that are the intended targets of dopamine. There are also dopamine antagonists (such as Olanzapine or ‘Zyprexa’) which blocks dopamine receptors. These drugs are not very helpful to Parkinson’s, but dopamine antagonist are commonly prescribed for people with schizophrenia. Are there other receptors of interest in Parkinson’s?